There has been much sad news this week, so it is my hope that you will be offered a little mental vacation with today's link line up. Goodbye Sunday newspaper, hello link love! I love the re-purposed glass bottles featured over at Someday Crafts...such delightfully inspiring projects and you can even add your own! Make your own baby coffee table art gallery with Just Something I Made. I wish I had found this idea when the Muffin Tin Kids were babes. This would have been so fun! 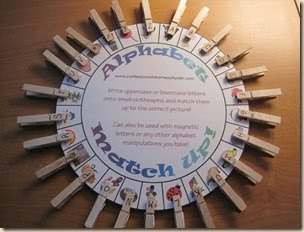 Since Friday, we have already done this Alphabet and Numbers Clothespin Match Up Activity from Confessions of A Homeschooler twice (photo credit above)! It's brilliant and there's a free printable. This is a fantastic activity to have on hand over the summer for those parents of preschoolers and Kindergarteners who want their little ones to retain what they learned. Love, love, love the clay marbles craft actvitiy from Pink and Green Mama... and I love her site-she always seems like she has so much fun not only crafting with her kids, but just being with them. And just when I think I have seen it all, my heart skips a joyful beat when I see these adorable scooby doo peg dolls from fancie fannie's etsy shop. The shaggy doll even has a little chin scruff-so perfect! whew....there's a lot of good stuff out there, happy clicking! The steadfast love of the Lord never ceases, his mercies never come to an end; they are new every morning; great is thy faithfulness. "The Lord is my portion," says my soul, "therefore I will hope in him. Thanks for the links. Going to check them out!! Hi! Thanks for linking to my clothespin activity! Hope you guys had fun and thanks for all your Sunday Paper links!